Enriched with Hyaluronic Acid to replenish and retain vital moisture within skin cells, the lightweight gel formula also utilizes a Phytomoist Complex, which is derived from edible mushrooms and helps to restore softness and reduce the appearance of fine lines for a younger-looking complexion. Skin will be brighter, more supple and thoroughly hydrated. Free from oils, alcohol, parabens, sulfates, gluten and fragrances. For complete usage instructions, please refer to your NuFACE device User Manual (included with your device). Step 1: Cleanse treatment area with an oil-free cleanser, like NuFACE Prep-N-Glow™ cleansing cloths. 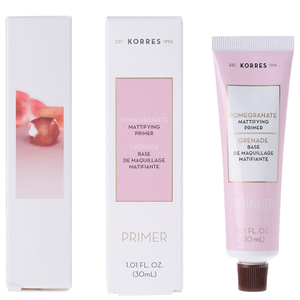 Step 2: Apply NuFACE Gel Primer in a mask-like layer one area at a time. Refer to your NuFACE device User Manual for treatment areas. Step 3: Glide along the natural contours of your face or body treatment area, in an upward motion. Each glide should last five seconds. Step 4: To treat your neck, place spheres slightly off center avoiding midline of neck. Glide toward back of neck until you hear the beep. Repeat three times each along the lower, middle and top of neck. Step 5: After treatment, massage in remaining Gel Primer into skin. Water/Aqua/Eau, Propanediol, Hydrolyzed Hyaluronic Acid, Tremella Fuciformis Sporocarp Extract, Betaine, Glycerin, Magnesium Sulfate, Carbomer, Hydroxyethylcellulose, Ethylhexylglycerin, Potassium Sorbate, Caprylyl Glycol, Phenoxyethanol, Sodium Hydroxide. I have been using the Nuface tool on/off for 5 years. 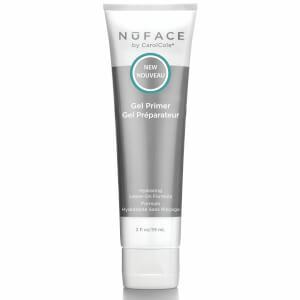 The only reason I was not consistent with the device until now is because the former gel primers offered but Nuface were too irritating for my sensitive skin. This latest formula which is this "Leave on Gel Primer" does not cause any redness or irritation so I am finally able to use the Nuface device 5 days per week and I see results! My husband even noticed the results. But the way, you can leave this primer on as per its title, but I feel more comfortable washing it off since it is sticky.... it is still a gel. After using the Nuface treatment, I prefer to use my own skin care products including BHA, retinol serum, vitamin C serum, and moisturizer.